The government of Saudi Arabia has been bombing and starving the Middle East’s poorest country for nearly four years now. As of December 2018, an estimated 85,000 children under 5 years old had died from malnutrition as a result of Riyadh’s intervention in Yemen’s civil war. If the Saudis’ air strikes and blockade continue, Yemen could suffer the worst famine humanity has seen in 100 years, according to the United Nations. The U.S. bears much of the responsibility for all of this: Our federal government’s steadfast commitment to an alliance with the Saudis has led America to support Riyadh’s monstrous campaign by supplying it with weapons, logistical support, and midair refueling services. Without that last form of support, much of the Saudi campaign would be impossible to execute. Late last year, a critical mass of U.S. senators decided that abetting a world-historic war crime — for the sake of helping a totalitarian Islamist regime install its puppet government of choice in a country that is of no strategic importance to the United States — was unwise. They passed a resolution ending American military support for the Saudi intervention out of the upper chamber. The GOP leadership then killed the measure in the House. The war raged on. The Saudis continued to block food and medicine from reaching rebel-held areas. It is unclear how many Yemeni children have died from starvation since Paul Ryan blocked the Senate’s attempt to end U.S. complicity in their suffering. But U.N. estimates suggest that 3.2 million Yemenis currently require treatment for acute malnutrition, including 2 million kids under 5 years old. None of this offends the moral sensibilities of the GOP leadership. But earlier this month, Ilhan Omar did. When the Democratic congresswoman suggested that AIPAC’s donors dictate U.S. policy toward Israel, House Republicans expressed horror at her callous indifference to the safety of a vulnerable minority group. After all, the idea that Jews use their wealth to control foreign policy is an anti-Semitic trope. Thus, by accusing the pro-Israel lobby of being good at its job, Omar was aiding and abetting neo-Nazis. Republicans invoked the Holocaust, demanded vigilance in the face of anti-Jewish bigotry, and called for Omar’s resignation. Then, they added an amendment condemning anti-Semitism to a House bill ending U.S. support for the Saudi war in Yemen. 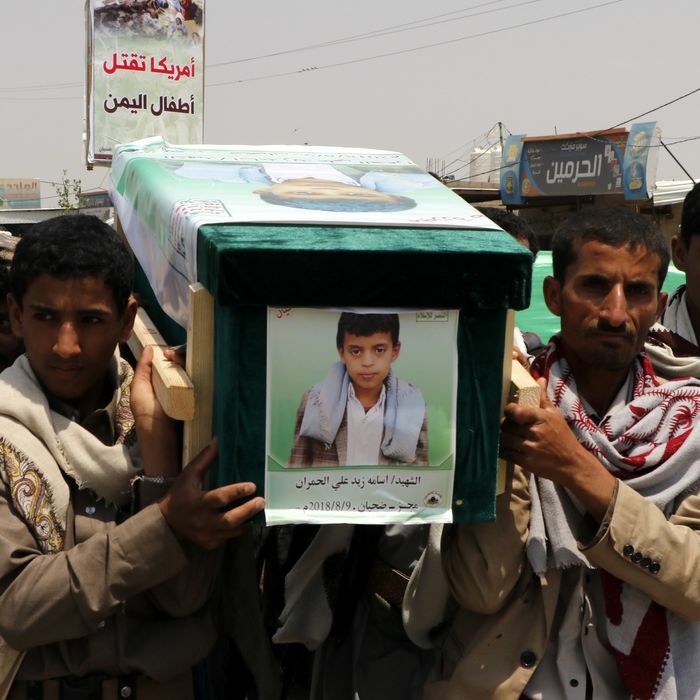 … Despite the parliamentarian’s ruling, senators still plan to force a vote on a clean version of the Yemen War Powers resolution, one authored by Sens. Bernie Sanders (I-Vt.), Chris Murphy (D-Conn.) and Mike Lee (R-Utah) … But House Republicans will likely try again to add language condemning anti-Semitism, a move that would put Democrats in an uncomfortable political position to vote “no” on the amendment in order to ensure that the War Powers resolution advances to Trump’s desk. If that amendment passes, the measure would face the same obstacle from the Senate parliamentarian. That last point is worth emphasizing: If the Senate finds a way to pass new legislation ending American support for the Saudi war, House Republicans (reportedly) plan to attack House Democrats as “soft on anti-Semitism” — unless Democrats vote to (effectively) prolong American participation in war crimes against a vulnerable ethnic group. Conservatives’ crocodile tears about the Holocaust have always been tough for me to swallow. By the time my grandmother hit puberty, Nazis had murdered her father, mother, sister, and brother. By the time I met her, paranoid delusions had gnawed at her mind. She could smell the poison “they” were pumping through the vents of her apartment. She could see that my (Jewish) father was a crypto-Nazi who was trying to kill her. Republicans will gladly condemn the source of her suffering if they can call it anti-Semitism. And they will loudly demand vigilance against anti-Semitism if they can define said vigilance as unconditional support for the Israeli government. But I believe that anti-Semitism is too narrow a term for the evil that stole my grandmother’s childhood. For all the Holocaust’s idiosyncratic features, on the individual level, it was experienced as mass murder; and mass murder is not an exceptional feature of human history. You don’t need to be a Polish Jew in the 1930s to see your family slaughtered because one powerful group wants your kind dead, while the others have no particular interest in keeping them alive. You could just as well be a Lakota “Indian” in late 19th-century South Dakota, or a Palestinian refugee at Sabra in 1982, or a malnourished mother in Houthi-controlled Yemen today. If I refuse to define my grandmother by her ethnicity and religion (as those who orphaned her did) — if I insist on remembering her primarily as a human being rather than as a Jew — then Republicans have no interest in respecting the historical traumas of all people like her, or remaining vigilant against the recurrence of such traumas. In fact, as McConnell has just demonstrated, Republicans (and some Democrats) don’t just refuse to acknowledge any moral tension between intoning “never again,” and facilitating atrocities in Yemen (or obfuscating the president’s hate speech against Native Americans, Muslims, and immigrants, or Israel’s crimes against the Palestinians); they will gladly intone the former as a means of facilitating the latter. Which is to say, they will express solidarity with the Jewish children of Nazi-occupied Poland for the sake of helping Riyadh starve the Yemeni children of Saudi-blockaded Sanaa. And then, they will ask those who oppose their efforts why they don’t take anti-Semitism more seriously.